The process of getting a loan is bad enough. Even with online personal loans, you have to worry about your credit score getting in the way and whether you can afford the payments. Then you’re hit with the possibility of the lender calling your boss or the bank. I understand that lenders need to make sure I can repay the loan and that I’ve been truthful on the application, but does my boss really need to know that I’m borrowing money? 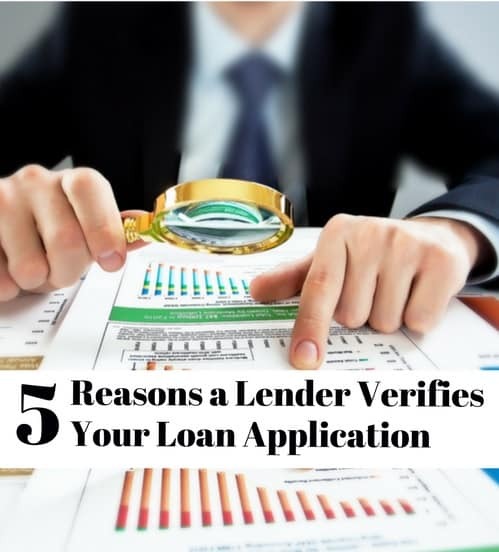 Here’s what lenders ask for on an application, what they do to verify and how you can get your money as fast as possible. What Can Lenders Ask for When Applying for a Loan? When a lender looks at your loan application, they’re usually looking for two things. What’s your ability to repay the loan? How much do you make, how much do you already owe and how much does that leave for making monthly payments? Are you telling the truth on the application? Just as your ability to the bank as your ability to repay the loan is catching potential fraud. Estimating your ability to repay the loan is as simple as asking for pay stubs, tax returns and bank statements. A lender will also ask for information around your employment like salary, years at the job and contact information. Most lenders don’t ask for all this information. Usually employment information is enough to start the loan application process. Catching fraud before they make the loan isn’t as easy though so lenders verify a certain percentage of applications. This will either mean the lender will ask for more documents; i.e. bank statements and tax records, or it will contact your employer for verification. Are Bank Statements Required for a Home Loan? Some loans will mean more intense verification. A $3,000 personal loan might not need to be verified after a lender has checked your credit, but a $300,000 home loan will always require bank statements and full verification. For a home loan, you’re also looking at other documents in the application process. You’ll probably be asked to provide proof of investments and any other assets. What Percentage of Loans are Verified by Lenders? Not every loan is verified by a lender. The percentage of loans verified differs by type of loan and by lender but there are a few things to consider that might help your application get approved faster. Loans for larger amounts are more likely to be verified. Loans qualifying for programs like Fannie Mae and other government sponsored entities will almost always require verification. Traditional lenders like banks are more likely to verify your loan application compared to peer-to-peer or online lenders. Borrowers with lower credit scores, missed payments or a history of defaulting on loans are more likely to need verification. Borrowers with a higher debt-to-income ratio are more likely to require verification. The actual percentage of loan applications verified ranges from about two-in-three to less than one-in-ten depending on lender. Bloomberg reported that Santander Consumer verifies just 9% of its loan applications. Personal loan sites like Lending Club is reported to verify about one-in-three applications. What is the Process for Loan Verification of Employment? Verification of your loan application can vary by lender. Many lenders will verify your application simply by looking at your bank statements or tax returns. It’s crucial that you have these ready just in case the lender asks or you could delay your loan for a few days. Even if the lender doesn’t ask, print out your last three months’ bank statements and know where to find your tax returns. If you’re worried about a lender calling your boss to verify employment, give them the number to the HR department instead of a direct line to your supervisor. Human resources knows better what kind of questions a lender can ask and isn’t allowed to spread the word about your loan. If a lender does contact your boss, they’re only allowed to ask a few direct questions. These include how long you’ve been employed and how much you make. Everyone needs to borrow money sometime so don’t worry too much about a lender calling your boss for verification. Be truthful on your loan application and have documents ready if the lender asks. Being able to provide these quickly could keep the lender from going to the next step and verifying employment.